Tower Lord is the second book in Anthony Ryan's A Raven's Shadow series. This is the follow-up to Blood Song, a stellar debut that Ryan had to publish himself before it was finally picked up by Ace and became a success. The third book in the series, Queen of Fire will be released next month, July 7th. This is a mini review since I read the book some time ago but I still wanted to share my thoughts. Vaelin Al Sorna, warrior of the Sixth Order, called Darkblade, called Hope Killer. The greatest warrior of his day, and witness to the greatest defeat of his nation: King Janus’s vision of a Greater Unified Realm drowned in the blood of brave men fighting for a cause Vaelin alone knows was forged from a lie. Sick at heart, he comes home, determined to kill no more. Named Tower Lord of the Northern Reaches by King Janus’s grateful heir, he can perhaps find peace in a colder, more remote land far from the intrigues of a troubled Realm. But those gifted with the blood-song are never destined to live a quiet life. Many died in King Janus’s wars, but many survived, and Vaelin is a target, not just for those seeking revenge but for those who know what he can do. The Faith has been sundered, and many have no doubt who their leader should be. The new King is weak, but his sister is strong. The blood-song is powerful, rich in warning and guidance in times of trouble, but is only a fraction of the power available to others who understand more of its mysteries. Something moves against the Realm, something that commands mighty forces, and Vaelin will find to his great regret that when faced with annihilation, even the most reluctant hand must eventually draw a sword. Blood Song was the story of Vaelin Al Sorna. The origin story of one of the most notorious, dangerous and extraordinary man alive. From the start, my expectations were great and Ryan delivered a compelling and serious tale of a conflicted youth growing up in the isolated monastery of a military order. There was a lack of woman presence and the world was mostly traditional medieval scenery but the prophecy, the legend of the man himself, the open threads at the end of the book and even the magical elements made it a strong Epic Fantasy book with eagerness to sell for the follow-up. Sadly, for me, Tower Lord was mostly a letdown. With the coming of age out the way and Vaelin already at the top of his game, opportunities were emerging at first but the pace and the overall story evolution was dragged down heavily. The split of points of views could have helped but the other threads didn't draw me in and didn't tie in cohesively, a hard assessment of the breakdown from the first opus. The additions are Reva, a young manipulated woman who wants to kill Vaelin and Princess Lyrna and brother Frentis from the previous book. New enemies had to come up and it seems that for the author, the political situation needed a significant development but the bad side effects of a bridging novel expanding the world appeared. 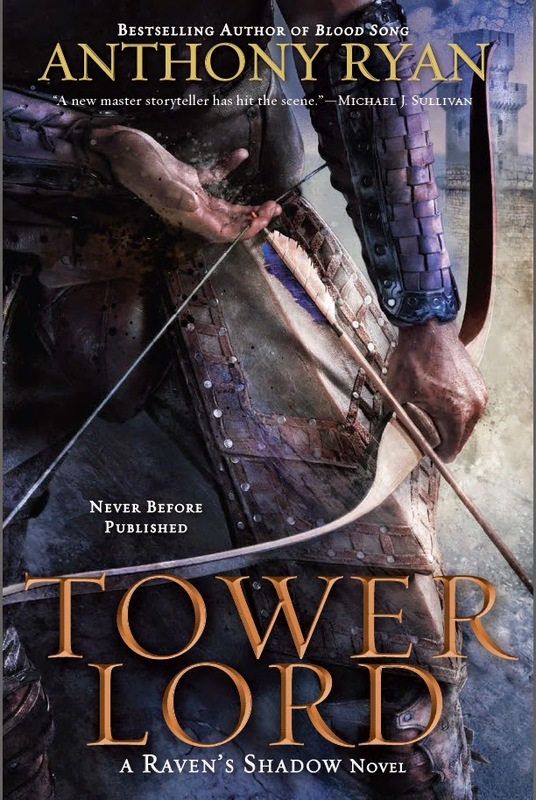 'Tower lording' seemed like a bore for a while, poor Vaelin, and I almost put the book down for good a couple of times. Still, I admit that the novel had some few interesting moments. Brother Frentis' storyline is captivating in some instances, due to his particular situation as a slave. There's also the addition of female protagonists in the spotlight, a missing element from Blood Song but the addition itself isn't enough. Moreover, even Verniers whereabouts lack mystery and intrigue. Why did the author throw out of his follow-up that many essential and successful features from one book to another? Will I pick up the third book? Maybe... but I ought to be convinced by a lot of arguments... aside from judging by the outcome of Blood Song, I know that Ryan can be a good writer but I think he has to come up with a tightly woven story, concentrated on Vaelin and few of the other characters instead of the world situation and the boring life of a Tower Lord in the deep North. Cover: Nice, probably one of the best featuring an archer I've ever seen. There isn’t much to nitpick with Tower Lord apart from the fact that it clearly suffers book two syndrome in that it’s a continuation of events in book one with foreshadowing for events in book three – which means it feels unfinished, and the pacing might not have the same sense of urgency and energy present in book one. The writing, however, is tight and Ryan succeeds in offering his fans exactly what they’re looking for – a stonking good fantasy epic.